Hello everybody! Today marks the end of another week, and time calls for another review. Today is different, however. Instead of a game, I will be looking at a mod for DOOM/DOOM 2, which are both my favorite FPS's of all time. Not only did DOOM scare the life out of me as a kid, it was one of the first games that brought attention to the not-so-popular first-person-shooter genre at the time. Now, as you can see in the picture above, the mod looks like a simple gore-mod. You can see brain bits, a ribcage, blood on the walls, etc., but it's much more than that. 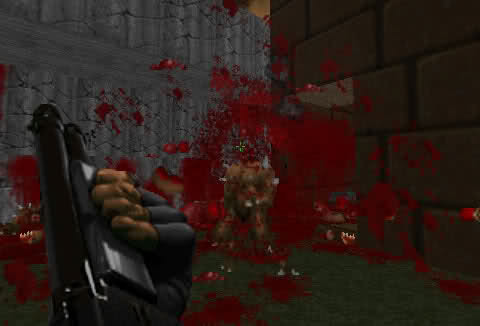 "Brutal Doom" was a mod that was created in 2010, which truly made an impact. 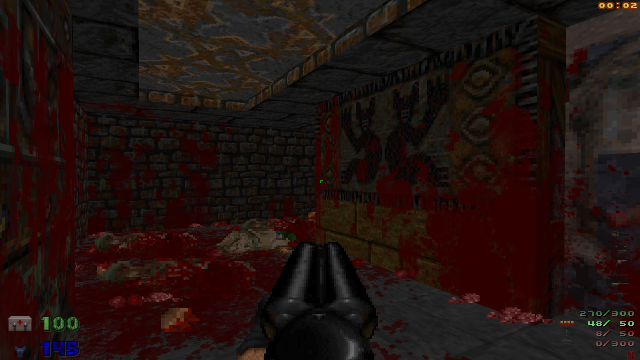 The mod even got public recognition by John Romero (co-founder of Id Software) on the 20th anniversary of the original DOOM. As I stated above, the most eye-catching feature is the excessive amount of blood, gore and overall violence. This being said, the mod changes various factors of the gameplay, combat, and graphics too. Small objects such as trees can now be destroyed and there are graphics improvements, including better shadowing. The actual gore-factor has gotten supremely upgraded to include more body parts flying out of enemies, blood splattering over your screen, and even sawing demons in half. Another big addition was 3D blood spots, which allow blood to splatter anywhere in the game. It's extremely appealing to see an enemy blow up into pieces in your face, covering the walls with blood. You can even kick your enemies "Duke Nukem" style! While some of these changes may seem to ruin the game, I find it keeps things fresh and new. Most of them add more to the game anyway, making it extremely fun to play even when I keep dying. Most importantly, however, is that it keeps the Original game's flavor. You are still running through a Mars base, trying to kill every demon along the way. It's going to be brutal this time, but the fact that the mod plays like the original game makes it a blast to play. One last thing that I also found to be cool was the mods creator. When I played the first couple versions of "Brutal Doom," they felt very experimental. Now that I have played the most recent version, I can say that it feels so much more polished and different when compared to its original release. It feels extremely dedicated and challenging, but in a really good way. When you finally manage to win, you get a feeling that says, "I just kicked Hell's ***." If you are looking to play through DOOM again, get this mod. It does not take away the positive feeling that you get with the original game, and it is a whole new experience. Think about playing through the original DOOM, but with a whole bunch of different seasonings and spices. It's easily one of the best mods for any FPS out there, and I suggest you check it out. Everything about the mod is simply amazing, and playing it feels like what DOOM should actually be. With that, I close off. I hope you enjoyed my small mod review, and I may do more in the future. Chao!